When I enter the sea I always enter as I would a friend's home: Peacefully and with Respect. I enter the sea, not to be with whales, but to be with the sea. Whales and all the other creatures of the sea will just be there. 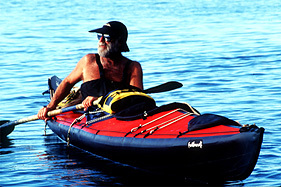 Since 1975 I have logged more than 20,000 miles of kayaking throughout the Hawaiian Archipelago. I have circumnavigated the islands of Maui, Lanai, Molokai and Kauai. My longest single voyage has been a 22-hour paddle from Maui across the Alenuihaha Channel to the Big Island of Hawaii. For me, the kayak is the vehicle that transports me into the very bosom of nature, where I can both observe and become a part of the tableau reaching out to the horizon and the distant shore. The Eskimo kayak, from which my craft is a modern-day adaptation, is a 9000-year-old means of travel perfectly suited to its environment and its tasks. Using the only materials at their disposal in the icy Polar Regions they call home. Eskimos made the original kayaks from the skins of sea mammals stretched over frames of whalebone and driftwood. Because of the materials and the construction of the craft, their kayaks were remarkably durable and seaworthy. The kayaks form, and flexibility allowed them the all-important advantages of maneuverability and silence when approaching prey. This was a time in history when nature's sensitivity to sound was understood and respected by man. Together, man and kayak were able to move quietly about the silent domain in-tune with their surroundings. The silence of their kayaks allowed Eskimos to hunt the walrus, whale, seal and sea otter, which provided their food, shelter and clothing. Russian explorers were the first westerners to see and adopt the kayak for their own use. In 1580 while sailing along the coasts of the Aleutian Islands, which extend westward from the coast of Alaska, they observed the native population using an enclosed, skin-covered boat for hunting and travel on the surrounding sea. They called this agile craft with one or two distinctive hatches "Bardarkas," and quickly adapted them to their own purposes in the hostile polar climate. As I travel about the vastness of the sea in my modern version of the ancient kayak, it is its ability to move in virtual silence that most appeals to me. From my body's position scant inches from the water's surface, experiencing the feeling of being surrounded by the sea and nearly weightless in my craft, I can feel at one with the sea and all its creatures. Living upon this weightless environment has many positive effects upon life. It creates a very stress free environment. Huge 40-ton Humpback whales weigh nothing in their ocean realm. Cradled by the sea, whales need only take short naps throughout the day and night to remain refreshed and alert. While resting however, it is believed that only one-half of their brain is at rest with the other half remaining alert and aware of their surroundings and environment. Perhaps the same works for me. While taking short naps during my time at sea, I feel extremely well rested, and at the same time I am acutely in-tune with my environment. "Days and nights are spent eating and sleeping from my kayak. Drifting between the islands of Maui, Moloka'i, Lana'i and Kaho'olawe Humpback Whales can be heard near and far during their winter sojourn in the Hawaiian Islands." Journal at sea. After several days and nights in my kayak two things happen. My heartbeat slows down considerably, and thought seems to escape me. I am in a very restful, peaceful, sensitive state of mind. This is nature's way. It has taken me many years at sea in my kayak to nurture this state of mind. Nighttime at sea adds a different perspective to life, especially from a kayak. I am merely a log or piece of driftwood floating upon this vast, weightless world. I lie back in my kayak after preparing a bowl of hot saimen or cup of hot chocolate and I listen. From changes in wind patterns and the breathing of a lone green sea turtle, to the quiet stealthy approach of a shark, it's dorsal fin breaking the surface next to my kayak, I feel their presence and I know they are their because I am a part of their world and they are part of mine. Over the past 20 years of kayaking I have developed a special bond with a particular female Humpback whale who at times will spend hours beside my tiny craft, made even smaller by her immense size. We knowingly and willing share each other's world. These are experiences I would wish for everyone. There is so much we can learn about living by putting ourselves closer to other creatures with which we share the planet. It costs nothing to view nature in nature's way: it takes only Time, Patience and Compassion. Only when mankind slows down the insane pace at which he lives, will the importance of natural surroundings be a meaningful concern. Until that day comes again, I fear nature is in jeopardy.